Mugabe rejects criticism that he has turned Zimbabwe into a "basket case"
Mugabe calls sanctions "unjustified and illegal"
NEW YORK (CNN) -- Zimbabwe President Robert Mugabe, in a rare interview Thursday, depicted himself as an African hero battling imperialism and foreign attempts to oust him rather than the widespread perception of a dictator clinging to power at the expense of the welfare of his people and country. Robert Mugabe says sanctions against his country are "unjustifiable." The 85-year-old Mugabe, the only leader of Zimbabwe since it became independent from Britain in 1980, rejected repeated assertions by CNN's Christiane Amanpour that his policies have driven the nation once known as Africa's breadbasket to virtual economic collapse. Instead, Mugabe accused Britain and the United States of seeking to oust him by imposing economic sanctions, the effects of which he said were worsened by years of drought. He denied that his country is in economic shambles, saying it grew enough food last year to feed all its people, and defended policies that have driven white farmers off their land as properly restoring that land to indigenous Africans. 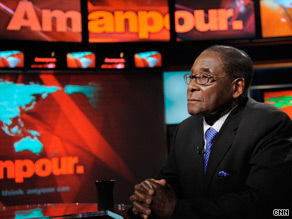 It was Mugabe's first interview with a Western television network in several years, and he appeared to get frustrated with some of Amanpour's direct questioning, repeatedly denying widely accepted evidence and reports on his nation's woes. Mugabe denied that his ZANU-PF party lost elections in 2008 that forced him to accept a power-sharing agreement with his chief rival, Morgan Tsvangirai, who now is prime minister. Violence surrounding the disputed election, much of it against opposition supporters, further damaged Zimbabwe's standing, but Mugabe rejected any blame on Thursday. "You don't leave power when imperialists dictate that you leave," he insisted. "There is regime change. Haven't you heard of (the) regime change program by Britain and the United States that is aimed at getting not just Robert Mugabe out of power but get Robert Mugabe and his party out of power?" Asked about Roy Bennett, a white opposition figure who has yet to be sworn in as agriculture minister a year after formation of the power-sharing government, Mugabe stammered before saying Bennett faces charges of "organizing arms of war" against Zimbabwe. He added that he's heard the prosecution lacks evidence in the case, but said he won't agree to swearing in Bennett until after any charges are dropped. Mugabe also denied any responsibility for harm to the nation from his economic policies, instead blaming what he called "unjustified" and "illegal" sanctions that he said were intended to bring regime change. "The sanctions must be lifted. We should have no interference from outside," Mugabe said. "The continued imperialist interference in our affairs is affecting our country adversely." When Amanpour challenged him by saying most of the sanctions were directed at individuals, rather than economic entities, Mugabe said she was wrong. "The U.S. sanctions are real sanctions, economic sanctions. Have you looked at them?" he said. "It's because of sanctions, mainly." Amanpour tried to push the point, saying outside observers blamed his policies and not sanctions. "Not everybody says so," Mugabe cut her off. "It's not true." He also rejected criticism from South African Archbishop Desmond Tutu, a Nobel Peace Prize winner for his role in the anti-apartheid struggle, who has accused Mugabe of turning Zimbabwe into a "basket case" and repressing his own people. Premiering this Sunday, a new weekly series will get people talking. Join Christiane Amanpour for a provocative analysis of global stories that matter to you. "It's not a basket case at all," Mugabe said. He later called Tutu's comments "devilish talk" and added: "He doesn't know what he's talking about, the little man." On the takeover of white-owned farms -- a policy blamed for undermining the agriculture sector -- Mugabe displayed the African nationalist fervor of his revolutionary days. "Zimbabwe belongs to the Zimbabweans, pure and simple," he said, then adding that white Zimbabweans -- even those born in the country with legal ownership of their land -- have a debt to pay. "They occupied the land illegally. They seized the land from our people," Mugabe said. When Amanpour pressed him on white farmers being forced off their land, he shot back, "Not just off their land. Our land." "They are British settlers," he said, later calling them "citizens by colonization, seizing land from original people, indigenous people of the country." Asked if would run again in elections likely to take place in 2011, Mugabe refused to answer, but denied he feared defeat and again rejected charges of past electoral wrongdoing. "Elections don't go all that smoothly all the time in many countries," he said, tossing a jab at the United States. "Look what happens elsewhere. They didn't go smoothly here, look at what happened during the first term of Bush."